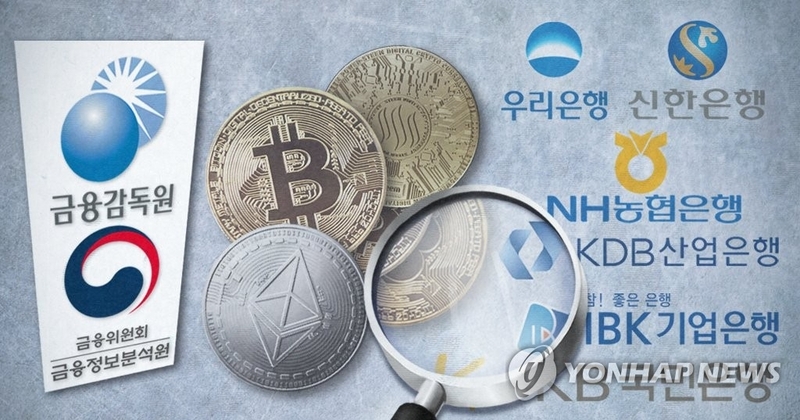 SEOUL, Jan. 7 (Yonhap) -- South Korea's financial authorities will inspect six major local banks over virtual accounts offered to cryptocurrency exchanges in a move to curb speculation and crack down on money laundering, a senior official said Sunday. In a rare move, the Financial Intelligence Unit and the Financial Supervisory Service (FSS) will carry out joint inspections on six lenders -- Woori Bank, Kookmin Bank, Shinhan Bank, NongHyup Bank, Industrial Bank of Korea and Korea Development Bank -- from Monday through Thursday. The officials will carry out an intensive probe into virtual accounts that the six lenders have provided to cryptocurrency exchanges, said an official of the Financial Services Commission (FSC). As of December, the number of accounts related to cryptocurrency exchanges came to 111 and their combined deposits are estimated at 2 trillion won (US$1.8 billion). Each account is presumed to have generated up to millions of virtual accounts. They are seeking to cut off fund inflows into cryptocurrency exchanges and shutter cryptocurrency exchanges that have loopholes in their system. The FSC plans to issue another warning message this week against cryptocurrency speculation. Choi Jong-ku, chairman of the regulatory body, is scheduled to hold a press briefing in Seoul on Monday afternoon to explain the background of the inspection and the government's resolve to continue to seek measures to reduce related risks. South Korea has said it will ban issuance of new virtual accounts to cryptocurrency exchanges under a new measure set to take effect around Jan. 20. The government also said only real-name bank accounts and matching accounts at cryptocurrency exchanges can be used for deposits and withdrawals in a move to curb a frenzy of speculative investment into cryptocurrencies. Cryptocurrencies, such as bitcoin and ethereum, have rapidly gained popularity in recent years among South Korean investors hoping to make quick money. South Korea is home to one of the world's biggest private bitcoin exchanges, with about 1 million people estimated to have some of the best-known digital currency. Despite a boom in cryptocurrency transactions, their exchanges go largely unregulated in South Korea, as they are not recognized as financial products. There are also no rules for protecting virtual currency investors. In December, Choe Heung-sik, governor of the Financial Supervisory Service said, "I bet the bubble in bitcoin will burst later."